This week’s challenge is to incorporate honey into your life. Although most of us know what honey is, few know just how many uses it has. Honey is a simple sugar that contains antioxidants, catalase, ascorbic acid, flavonoids and alkaloids. These helpful free-radical fighters have been scientifically proven to reduce the risk of heart disease and cancer. Not all honey is created equal. Raw honey preserves micronutrients and enzymes. Studies on friendly bacteria, blood sugar, weight management, and cholesterol have shown the positive side effects of eating raw honey. Believe it or not the artificial honey market is growing. Americans consume 400 million pounds of honey each year but only 149 million pounds are produced in the states. Enter cheap imports. Due to the rapidly declining bee population and the high cost of honey, manufacturers dilute this delicious substance with various form of artificial sweeteners. Pollen is removed because it is the only marker that can determine where the honey is sourced. Without pollen, manufacturers can add as many artificial sources as they choose. In 2014 researchers at Texas A& M University tested commercial honeys and concluded that 75 percent of the pollen had been removed. But there is hope! The FDA recently drafted guidelines that state, “Only manufacturers that do not add sugar, corn syrup or other sweeteners should label their products as pure “honey.” It is also important that we as consumers read labels and know exactly what we’re buying. Don’t have access to the label? Rub the honey between your fingers. If it’s sticky, it’s probably fake. So what can we do to help? Olivia Box, beekeeper and honey bee researcher suggests, "The absolute best thing you can do is buy local honey. Whether it is from your farmers market or a friend, supporting local beekeepers is key to making sure we can push artifical honey off the market. Be sure to check your labels for where it is from and what is in the honey!" Besides adding sweetness to our food and free-radical fighters to our bodies, honey has many other beneficial uses. Do you have trouble falling asleep? Allergies acting up? Does your memory need a boost? Add pure honey to your diet and see why It’s the bee’s knees!So grab a jar of the sweet stuff (preferably raw, organic, fair trade) and have at it! Call it the fountain of youth, a beauty balm, or a miracle fix-it, coconut oil has made its mark. This week’s challenge: Try some coconut oil. Whether you add it to your favorite Thai dish, apply it as a face mask, or apply it just because it smells so good, try it out and let us know what you think. 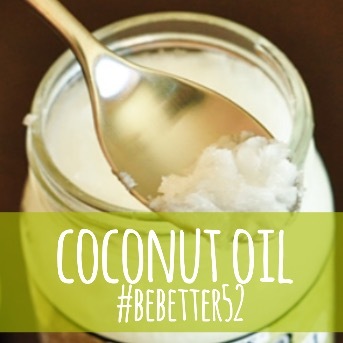 For coconut oil aficionados our challenge to you is to discover a new way of using your favorite cure-all. Among its more well-known properties, coconut oil effectively locks in moisture and relieves irritation, making it a perfect substitute for a body cream, lip balm, aftershave, or hair mask. The lauric and capric acid in coconut oil has also been shown to fight inflammation, so slather on bruises or small cuts to naturally ward off bacteria. Health-wise the jury is still out on the benefits of cooking with coconut oil. Some claim the high saturated fat content (90% compared to butter at 64%) can increase the risk of high cholesterol and heart disease, while others believe coconut oil increases “good” HDL cholesterol. Others have stated that coconut oil is the key to weight loss and an increased metabolism as well. Walter C. Willett, M.D. of the Harvard School of Public Health recommends it be used sparingly, stating, “Coconut is a wonderful flavor…but it’s still probably not the best choice among the many available oils to reduce the risk of heart disease.” To play it safe, apply this luscious oil on cuticles, hair, and skin, but proceed with caution when cooking. However, not all coconut oil products are created equal. There’s refined vs. virgin, organic vs. commercially grown and some is classified Fair Trade while others are not. We at Be Better prefer virgin because it is unfiltered and does not include any additives which can irritate the skin. Certified organic products do not use pesticides although some coconut oils without the USDA organic label may be organic as well. Fair trade coconut oil will ensure that those who produce the product receive a fair wage for their work. Of course, budget can dictate which coconut oil you choose, but due to popular demand, coconut oil is much less expensive than in the past.